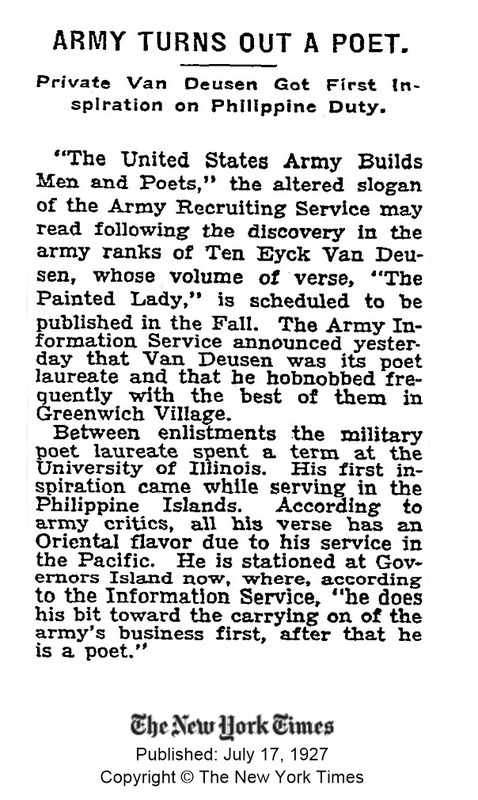 "The United States Army Builds Men and Poets," the altered slogan of the Army Recruiting Service may read following the discovery in the army ranks of Ten Eyck Van Deusen, whose volume of verse, "The Painted Lady," is scheduled to be published in the Fall. The Army Information Service announced yesterday that Van Deusen was its poet laureate and that he hobnobbed frequently with the best of them in Greenwich Village. Between enlistments the military poet laureate spent a term at the University of Illinois. His first inspiration came while serving in the Philippine Islands. According to army critics, all his verse has an Oriental flavor due to his service in the Pacific. He is stationed at Governors Island now, where, according to the Information Service, "He does his bit toward the carrying on of the army's business first, after that he is a poet."